Married 5/21/1918. Brother to Maude, Elsie, Frank, Dora, Jessie, Fred & Blanche Mary. For more details click on George's name above. 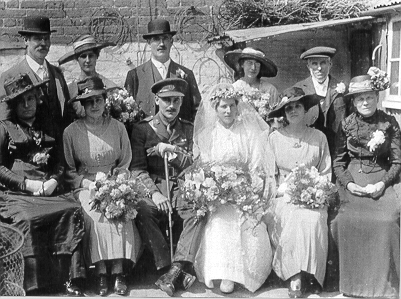 Sister to Albert, Edie, John, Jane, Freddie & Ernest (dob 1904). A Carter by trade, then Corn Dealer, assisted by his oldest son William (b.1861). His brother Joseph (b.1835--a Carman) also lived with the family. Also brother to: Thomas (1837), Marianne (1842), David (1844), George (1849) & Noah (1853). A Straw Plaiter, making straw hats and bags. Daughter of George Goodge and Hanna Marlow. MarriedJames Feb. 9,1860.